Cote’s Mechanical offers the very latest in high-tech air conditioners for homeowners across much of Northern Texas. We offer an abundance of options – whether you are looking to upgrade an outdated or ineffective system, move to a ductless unit, or add an air conditioning system to a new home construction. 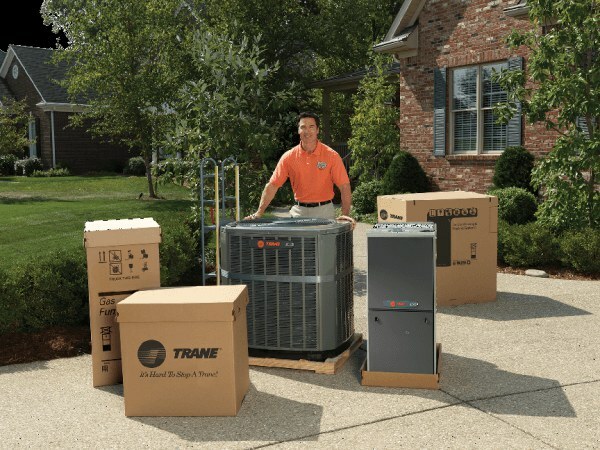 Installing an air conditioner, whether it is a new installation or a replacement, is a big job. That’s why choosing a well-respected professional for the job is so important. Here a Cote’s Mechanical, we’re proud of our reputation for exceptional A/C unit installations and replacements. We would love the chance to work with you if you find yourself needing a new air conditioner. Before we begin any project, our team of experts will evaluate the job to determine the size, scope, and budget for your air conditioning system. As members of the Sanger, Texas community, we go the extra mile to make sure you are 100% pleased with your purchase and the installation we do. Our experts will explain the pros and cons of different systems and recommend what we feel is the best fit for your home or business. That way, when we’re done with the installation, you can sit back, enjoy the nice cool comfort, and feel pleased about a job well done. One of the questions we get asked on a regular basis regarding A/C unit installations and replacements is whether choosing the biggest possible ac unit is the best way to keep your home cool. In most cases, no. A bigger unit may get your home cooler quicker initially, but the unit will run a shorter amount of time, so it doesn’t do its secondary job of removing moisture from the air. In other words, your home will stay more humid. In addition, the perceived energy savings simply are not there. You’ll likely spend more money to run that ultra-powerful unit for less time. That’s why when we respond to installation and replacement calls, we recommend properly-sized units. Age of the System – While every unit is different, if the system is over 12 years old and giving you problems, it may be time to consider replacement. Fit for the Home – What unit was originally installed? Unfortunately, when homes are first constructed, sometimes there are corners cut. If your A/C system is too small to adequately cool the home, we may recommend a replacement. The expense of repairs – When the repairs are going to cost a significant amount, we may recommend replacement simply because of the financial benefits. Not only will you have a new system, but you’ll have the warranty that comes with it and likely some savings on your energy bills too. If you have any questions or concerns about air conditioning replacement, call or contact one of our professionals at Cote’s Mechanical today. Air conditioning installation – whether in new construction or in a home that has only had window units in the past – is a major undertaking. It involves adding ductwork (unless utilizing a ductless A/C system, of course) as well as the air handler, compressor, vents, and other equipment. Because A/C installation is not a simple job, you don’t want to trust just anyone to do it. Let Cote’s Mechanical work with you on this major undertaking. Our NATE-certified technicians will come out and survey the property thoroughly to determine the best system for the job. We’ll then be able to determine what ductwork or other supplies will be needed if we recommend a system with ducts. Once we’ve finished our analysis, one of our experts will go over the process and your A/C unit options with you in a simple, easy-to-understand manner. We want you to be 100% comfortable with the project and all decisions made. Contact the Cote’s Mechanical team today for more information about air conditioning installation or replacement. Our goal is to get you cool and comfortable quickly and with as few worries as possible!